Multiple Drupal & Joomla sites affected.. The Spyware campaign we wrote about two weeks ago continues to be active, although the number of infected websites has gone down. We are also seeing two other popular Content Management Systems (CMS), Drupal and Joomla sites being compromised and leveraged in this campaign. The Zscaler security research team started investigating multiple WordPress related security events earlier this month and came across a new widespread compromised WordPress campaign leading to the download of unwanted applications. This has been briefly covered by dynamoo and has been reported by some users on official WordPress forums. During our research, we discovered that this campaign started in the first week of August, 2015 and has been fairly active since then resulting in over 20,000 security events to date from over 2,000 web pages. Majority of the WordPress sites affected by this campaign are running latest version 4.3.1 but the compromise could have occurred prior to the update. Although the target domains varied across the transactions that we saw, the associated server IP address has remained the same. The IP Address 91.226.33.54 associated with these domains is hosted in Latvia through a VPS hosting provider. The collected information is relayed back to the same server via a HTTP GET request. This is followed by a series of redirects leading to download of spyware or potentially unwanted applications (PUA) masquerading as legitimate applications. The page prompts the user to update or install a new flash player update. 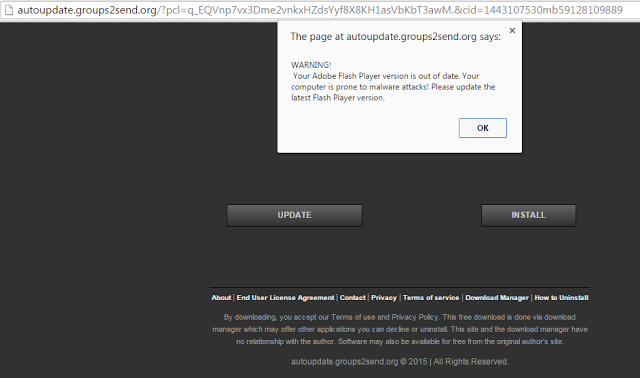 Regardless of the option the user selects, a fake Adobe Flash Player application is downloaded. This file is a .NET Compiled executable which downloads and executes another setup file named FlashSetup.exe. Once the spyware installation is complete, the user is redirected to the legitimate Adobe page indicating that the installation was not successful prompting the user to start over. If the user chooses to start over the installation, Adobe Flash Player will be installed from the genuine Adobe site. In another case, the webpage prompts the user with a fake MediaDownloader software update which is a variant of PUA Win32.DownloadAssistant. The end result is same where a potentially unwanted application is downloaded and installed on the victim machine. These applications have the capability to download additional malicious or unwanted applications. We also saw instances of fake web browser plugins being downloaded and installed. Below is an example of a Google Chrome Plugin - NewTabTV plus. The compromised sites involved in this campaign are distributed worldwide and not limited to one particular region. WordPress, being one of the most popular Content Management Systems & Blogging platform, remains an attractive target for cybercriminals. Unlike previous campaigns involving Malware Authors and Exploit Kit operators, the end payload getting served in this campaign involves spyware and potentially unwanted applications. These applications may seem innocuous but can facilitate malvertising based attacks through unsolicited advertisements. Zscaler ThreatLabZ is actively monitoring this campaign and ensuring that Zscaler customers are protected.